Hi Simon! Now that I am back from my last business trip I thought I would drop by over here and share some feedback across about a couple of very interesting and insightful concepts that I think would be very much related to Working Out Loud and which may have helped as the previous seminal work back in the day for the foundation of Working Out Loud a few years later. Back in the early days of 2006, James Governor (a.k.a. @monkchips @monkchips) coined Declarative Living which I guess was one of the very early introductions of “showing your stuff” that we could reference as the family tree from #WOL. A year later, Leisa Reichelt (a.k.a. @leisa) put together this other article around Ambient Intimacy where she described pretty nicely what’s probably the early origins of working out loud through Flickr, Upcoming or Twitter itself. 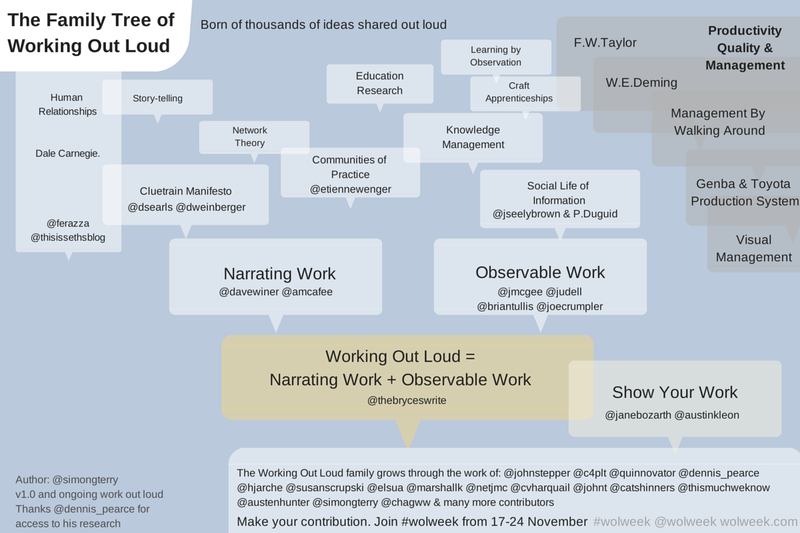 I think adding both items into the family tree of Working Out Loud would be wonderful to help complete the picture and help us understand how it all got started a few years back already. Let me know if you would need more help or information details and I will keep digging some additional resources as we move forward.